Norpro - Black Walnut Cracker for Serious Nut Crackers! Need a easy and fun nut roller for Pecans, Almonds, Hazelnuts, Large Acorns, Small Acorns, Joba Beans, English Walnuts, Macadamia Nuts, Sweet Gum Balls!? Look no further! Our Mini Nut Harvester is a backyard nut roller for easy nut picking upping! The 18" Bag-A-Nut Black Walnut Harvester-- finally! A Nut Picker Upper for larger nuts! Three options to chose from! 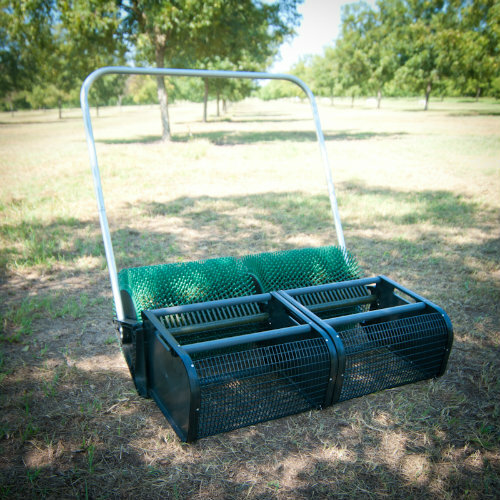 Our largest push Nut Roller with 36" of nut gathering wheels and a double basket for maximum collection! 36" Black Walnut Picker Upper that attaches to your riding lawn mower, ATV or golf cart! Two baskets and extra long wheel length equals loads of Black Walnuts-- with minimal effort!